Following blockbusters themed around the skeleton, drugs, personal identity and dirt – subjects in which we all have a daily interest – Wellcome Collection's latest exhibitions might seem a little abstruse. Called 'Miracles and Charms', the show is divided into two. One half is hung with Mexican religious paintings, the other strewn with lucky trinkets. Don't be put off if neither of these sounds relevant. Both exhibitions are fascinating in their own ways; charming, you might say. Infinitas Gracias: Mexican Miracle Paintings is like no exhibition we've seen before. It collects together over 100 votive paintings, each showing a desperate situation eased by the intervention of a saint. 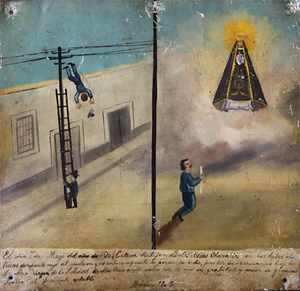 If, say, you fall off a ladder in Mexico and pray to your saint of choice, you'd be honour-bound upon your recovery to create or commission a votive painting by way of gratitude. The eye-catching collection brought together here covers incidents from the 19th Century right up to modern times. Many are surreal to the unfamiliar eye. When did you last see a painting of a tram accident with a cone-shaped being descending from the skies? We were reminded of the famous wall of heroic deaths in Postman's Park, which relates the fatal sacrifices made to save others – only here the stories have a happy ending. The exhibition also contains a wall of modern-day offerings to the saints, including a pair of child's pyjamas covered in thankful words and a recent votive painting showing the incubator that saved a premature baby's life. Charmed Life: The Solace of Objects, meanwhile explores the use of personal charms by Londoners of yesteryear. Most objects are drawn from the collection of Edward Lovett (1852-1933), a London folklorist who will be familiar to anyone who's visited the Cuming Museum in Walworth. Corals, teeth, a rabbit's tongue, a nail-studded sheep's heart, a phallic door handle...people adopt objects that are both curious and prosaic as personal charms. At the centre of the exhibition, artist Felicity Powell has arranged hundreds of these trinkets into a glowing horseshoe-shaped cabinet. The owners of these charms are long-gone, but their cherished oddments remain. Highlights around the edges include a lucky coin belonging to Samuel Johnson and a map of London created by Lovett to show the distribution of lucky blue beads. Felicity Powell has also contributed numerous works of her own, including a beautiful sequence of wax sculptures on glass discs, inspired by the collection. Two videos, including one of the artist's body under MRI scan and superimposed with lucky charms, complete the exhibition. It's impossible to convey the subtleties of these two shows with words. So have faith in our recommendation; go be charmed by the power of prayer, hope and chance. 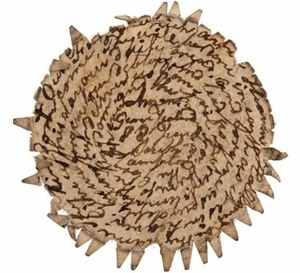 Miracles and Charms runs at Wellcome Collection until 26 February. Entrance is free. An events programme supports these exhibitions.